It is the name given to a rare type of malignant tumor arising in a part of the eye known as the retina. It generally arises in the early years of childhood, typically before 5 years of age. The ICD9 Code for this disorder is 190.5. The condition affects 250-350 children in the United States on an annual basis. It accounts for around 4% of all cases of cancer in children who are less than 15 years old, particularly those under 6 years of age. It is most commonly detected in kids aged 1-2 years. It is the form of the condition that affects only one eye of an individual. In this disorder, tumors are only present in one eye. The majority of patients develop a single tumor in only one eye. It is the most prevalent type of Retinoblastoma that affects around 60% of all sufferers. Around 85% patients with this form of the disease do not have a hereditary form of the condition. It refers to Retinoblastoma that affects both eyes of an individual. It is observed in around 1/3rd of all sufferers of the condition. The disorder arises in kids born with a mutation in the gene RB1. Hereditary Retinoblastoma may manifest itself as either unilateral or bilateral. It is the form of the condition that affects the pineal gland of sufferers. The pineal gland is a small endocrine gland situated within the brain, under the posterior section of the corpus callosum, which secretes melatonin. Trilateral Retinoblastoma (TRB) is a well-recognized, although rare, condition. It is also known by various other names, such as Pineoblastoma and Primitive neuroectodermal tumour (PNET). The disorder affects around 5% kids with a constitutional RB1 mutation. The condition may affect one or both eyes of an individual. 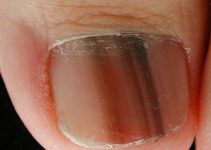 In children with this disorder, the pupils may develop white spots or even appear white in appearance. In flash photographs, a white glow is often seen in the eyes of sufferers. The pupil may look distorted or white instead of the ‘red eye’ that is typically observed in photographs taken with a flash. Bone pain and other problems may ensue in case cancer spreads to other regions of the body. The condition results from a mutation in a gene that controls the division of cells. This makes cells grow abnormally and turn cancerous. 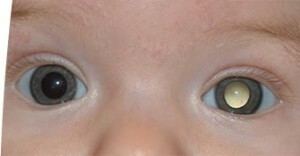 In around half of all cases of Retinoblastoma, the mutation arises in children without any family history of eye cancer. Naturally, a hereditary cause is ruled out. In other cases, the mutation is found to be present in several members of the same family that an affected child comes from. There is a 50% risk of the children of a Retinoblastoma sufferer to get the mutation if it is found to run in the family. Therefore, they would have a greater risk of developing the condition themselves. The majority of cases of this disorder arise as a consequence of mutations in RB1, a tumor suppressor gene that usually regulates the growth of cells and prevents rapid or uncontrolled division of cells. Most RB1 gene mutations prevent it from manufacturing any functional protein. Naturally, it is unable to regulate cell division in an effective manner. As a consequence, some retinal cells can divide in an uncontrolled manner to form malignant tumors. According to some studies, additional changes in genes can influence the occurrence of Retinoblastoma. These changes may help explain differences in the growth and development of tumors in various individuals. A small number of cases of Retinoblastoma occur as a result of deletions in the chromosome 13 area that contains the RB1 gene. Sometimes, doctors may recommend the use of anesthetics for a more accurate exam to keep an affected child still during the initial stages of diagnosis. Imaging tests help doctors find out whether or not the condition has spread to affect other adjoining eye structures. In some cases, a doctor may recommend patients to other specialist healthcare providers, known as oncologists, who are experts in treating cancerous conditions. Some patients may also be recommended to visit a surgeon or a genetic counselor. The curative options used for treating this disorder depend on the location as well as the size of the tumor. Cryotherapy or laser surgery may be used for curing small tumors. Radiation is implemented for both larger and local tumors. If the tumor is found to spread beyond the eye, Chemotherapy might be required. This is a medicinal treatment that uses chemicals to destroy cancerous cells. The drugs can be administered in a pill form or injected through the blood vessels. The drugs travel all through the body to destroy the malignant cells. Chemotherapy may also be implemented in curing Retinoblastoma that spreads to tissues in other regions of the body or those external to the eyeball. In kids suffering from Retinoblastoma, this therapy may help shrink a tumor. Another process, such as Thermotherapy, Cryotherapy, Laser therapy or Radiation therapy may be used to cure the rest of the cancerous cells. This may negate the requirement of surgical cure for affected children. If the tumor fails to respond to other treatment approaches, a process known as Enucleation may be used to remove the affected eye. In case of some sufferers, especially those in the advanced stages, this may be the first treatment option. The outcome of this disorder is generally positive. Almost every patient can be successfully treated if the cancer does not spread beyond the eye. However, some cases may need aggressive treatment and require even removal of the affected eye to be cured successfully. If the cancer spreads beyond the eye, the chances of a cure are reduced. Recovery depends on the manner in which the tumor has spread. The disorder may give rise to a few complications, which can be physically and emotionally extremely disturbing for sufferers. The affected eye may turn blind. The tumor can spread through the optic nerve to the socket of the eye. The malignant growth may also spread to other regions, like the bones, the lungs and the brain. Kids who have been treated for Retinoblastoma have a risk of recurrence of cancer in and around the cured eye. Due to this reason, a physician is likely to schedule follow-up exams to detect cases of recurrence of this malignant disease. A doctor may redesign a follow-up exam, especially personalized for a child. In the majority of cases, this is likely to involve exams of the eye every few months for the first few years after the course of treatment for Retinoblastoma comes to an end. Children affected with the inherited form of this disease are also at an elevated risk of developing other forms of cancer in any region of the body in the years following treatment. Due to this reason, kids with an inherited form of Retinoblastoma may undergo regular exams to be screened for other cancerous conditions. It is not possible to prevent the condition as its exact causative factors have not been identified as yet. Families can derive some benefit and understand the risk of development of this disorder by seeking genetic counseling. This is particularly necessary in cases where more than one family member is found to have the disorder, or if Retinoblastoma affects both eyes of an individual. When detected in the early stage, when the tumor is small, cure is possible and vision can be preserved in sufferers. A genetic counselor can discuss the benefits and risks of genetic testing and decide whether a couple and their children need to be tested for genetic mutation. The following images will help you understand how the eyes of children affected with this condition appear to view. If you observe any changes in the eye of your child that resemble the symptoms of Retinoblastoma, get in touch with an eye specialist on an immediate basis. Check whether the eyes of your child appear abnormal in recent photographs. Delay in diagnosis and treatment can impact your child’s vision and affect his or her overall health in future. Timely cure can preserve the vision and let your kid have as normal a childhood as possible. It would also ensure a faster recovery. If you have a family history of the disease, ask a pediatrician when regular eye exams should begin for your child to screen him/her for Retinoblastoma.